Aquatic algae can sense and adapt to changing light conditions in lakes and oceans, making them able to use a wide range of color, according to a new paper. Phytochromes are the eyes of a plant, allowing it to detect changes in the color, intensity, and quality of light so that the plant can react and adapt. Typically about 20 percent of a plant's genes are regulated by phytochromes and the phytochromes use bilin pigments that are structurally related to chlorophyll, the molecule that plants use to harvest light and use it to turn carbon dioxide and water into food. 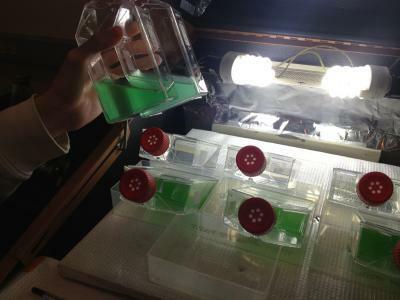 Phytochromes from land plants respond to red light — plants absorb red and reflect green light, which is why they look green- but red light does not penetrate far into water, and some marine and shore-dwelling algae lack phytochrome genes. The new paper, says senior author and UC Davis Professor Clark Lagarias, shows that phytochromes from algae, unlike those of land plants, are able to perceive light across the visible spectrum — blue, green, yellow, orange, red and far-red. This broad spectral coverage likely helps algae make use of whatever light they can in the ocean, Lagarias said — whether adjusting their light-harvesting chemistry for changing conditions, or rising and sinking in the water column as light levels at the surface change. Because different colors of light penetrate to different depths in water, algae face challenges in light harvesting that land plants do not. This work from the Lagarias lab shows one way that algae can rise to the occasion. Land plants detect light with pigments called phytochromes, which are sensitive to red light. But red light is absorbed by water, so aquatic algae have evolved phytochromes with a much wider spectrum. Video by Andy Fell/UC Davis. Phytochromes themselves have a long evolutionary history and likely arose from the interaction between oxygen and bilins, pigment molecules closely tied to chlorophyll and the oxygen-carrying heme pigment in hemoglobin, Lagarias said. The ancestral form appears to be sensitive to red light, similar to phytochromes of modern land plants. But between the origin and today, phytochromes went through a stage of massive diversity when they could detect a much wider range of wavelengths. "It's a molecule that has been there and back again," Lagarias said. The discoveries help researchers better understand the role of light and response to light in shaping ecology, as well as a model for how living cells react to light. They could also help in breeding of aquatic crops that could take advantage of different light conditions.